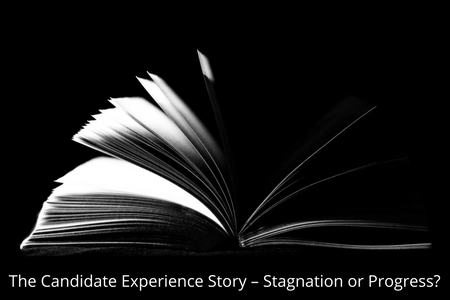 The Candidate Experience Story – Stagnation or Progress? A great deal has been written about the candidate experience and how important it is to make the experience a positive one. Since the arrival of the internet and social media, it is all too easy to vent frustrations of a bad experience be it shopping or job hunting. At the end of last year, a post on LinkedIn attracted an astonishing amount of attention simply because a company had thanked and sent a gift to a rejected candidate for his time and effort during the recruitment process. You would have thought this was standard practice and the minimum courtesy a candidate deserved, but the fact that so many people liked and commented on the event showed just how unusual it is. It was equally baffling that the positive responses (and great PR) the company received seemed to come as such a surprise to so many. Yet the results of a survey run by The Talent Board confirmed this is happening all the time. Their surveys show that candidates with a positive experience will actively champion the company to others as a good place to work whether they were successful or not but similarly those with a negative experience would actively discourage others to apply, would buy fewer goods and services and are likely to publish their frustrations on social media. How easy would it make corporate life if all candidates had a positive experience thereby eliminating risk of bad press to damage corporate reputation? The message seems clear. Treat your candidates well and you will reap the benefits, treat them badly and your reputation could suffer irreparably. You only have to look at Glassdoor to see comments about a company, both good and bad, from the interview process, through to what it is like to work there. A prospective candidate will almost certainly look at Glassdoor before their interview to check out the reviews. In fact, job hunting and shopping are approached in much the same way due to the ease of access to information. Most people will research their intended purchases in depth before committing to handing over cash, and candidates will do the same. According to CareerBuilder, the average candidate uses 16 resources when looking for a new job. If the reviews they come across are negative, they might not even bother to apply for the role at all and a great candidate is lost, potentially to a competitor. • Look at your process through the eyes of a candidate. • Communicate at every stage. • Personalize the recruiting process. • Ask for feedback and act on it. • Provide an alternative to a job if none exists at the time – engage with individuals, build a talent community and let them know when new roles are coming up. • Facilitate contact with current employees. Getting to know the team in advance can help both parties and makes for a more productive interview. • Keep in contact and make it two-way so the candidate has someone to communicate with throughout the process. • Give feedback whether negative or positive and thank the candidate for their time and effort, particularly if they were a long way into the process. A personal communication to the rejected candidates can make a huge difference to how they perceive the company moving forward. • Ask for feedback from the candidate. According to The Talent Board 73% of candidates said they were never asked to provide feedback on the screening or interview process and yet their experience is key to improving your recruitment process. A recruitment agency can help to fill the gaps in a corporate system and can act as middle men, championing the candidate and client alike while maintaining communications through complex systems and protocols. If recruitment is done entirely in-house, it is important to retain the personal touch an agency can provide and make sure the process is consistent and transparent. Where once the corporate and employer brand of a company had clear distinctions, now, with the all-pervasive social media and free access to the internet, the boundaries are very blurred and there are clear advantages to treating candidates just like customers. In an age of severe talent shortages, attracting the right candidate and then treating them with courtesy and respect throughout the recruitment process is going to go a long way to staying ahead of the pack. Transforming a stagnating candidate experience into a progressive, state of the art system that is admired and envied by the competition is achievable and arguably essential for any company large or small. At Chapple we specialize in sourcing candidates in external and internal communications, employee engagement, change and business transformation roles. Contact us on 020 7734 8209 for more information about how we can help you find your next role or indeed find the right people for your business.